High cost of travel getting you down? Well, things are looking up… WAY up! 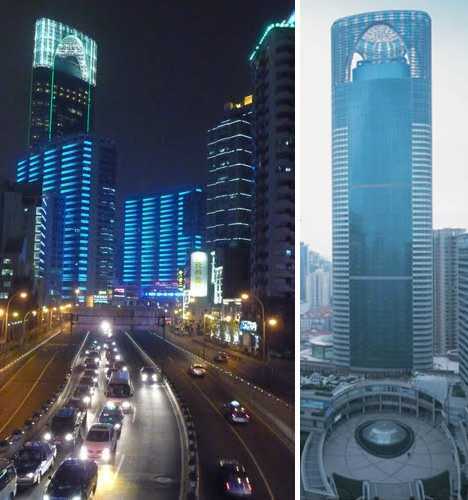 Check in to any one of the world’s 10 tallest hotels and you’ll enjoy heavenly views not seen since Mary and Joseph were told there was no room at the inn. How suite it is! 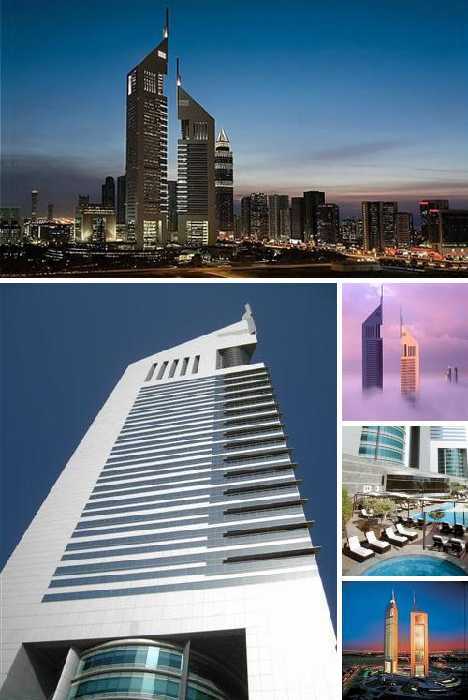 The Rose Rayhaan by Rotana, commonly known as the Rose Tower, opened on December 23, 2009, and is the world’s tallest hotel. 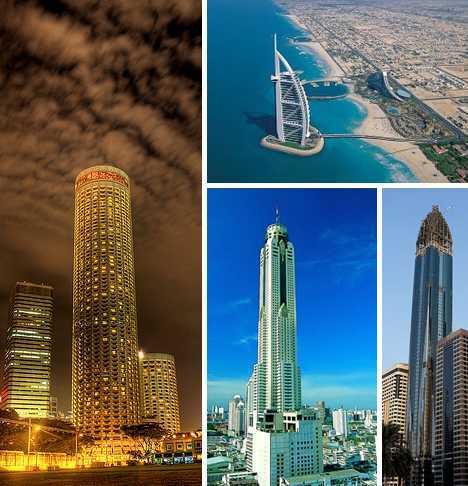 The 72-story building stands 333 meters (1,093 ft) high and overlooks several other sky-high hotels and commercial skyscrapers that make up Dubai’s spectacular skyline. Construction on the Rose Tower began in 2004 and the hotel was deemed completed in 2007, however economic conditions resulting from the 2008-09 global financial crisis contributed to the long delay before opening. The Rose Tower offers guests a choice of 482 rooms, suites and penthouses but be advised: the hotel is officially alcohol-free. 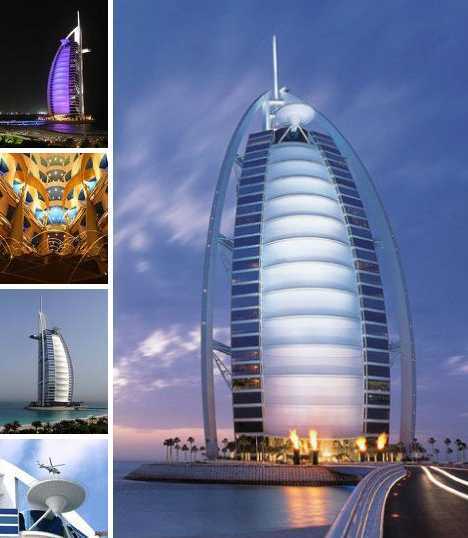 There are hotels and there are hotels… and then there is the Burj Al Arab. This uniquely beautiful hotel stands 321 meters (1,053 ft) in height and stands on an artificial island situated 280 meters (920 ft) out from Jumeirah Beach in Dubai, UAE. Access to the mainland is via a private curving bridge. This beautiful hotel was designed to evoke the appearance of a traditional Persian Gulf dhow. The Burj Al Arab opened in 1999 after nearly five years of construction – three of which were used to build and stabilize the artificial island it stands upon. 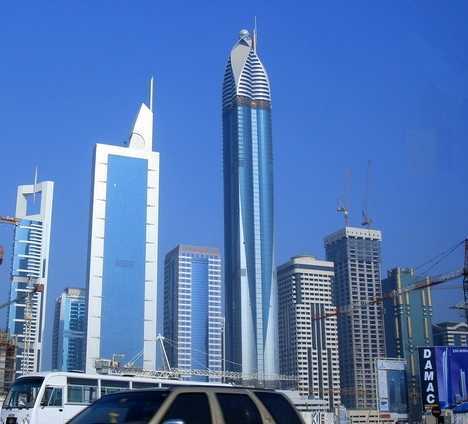 The hotel is 60 stories tall and has emerged as a symbol of Dubai’s extravagant construction boom. 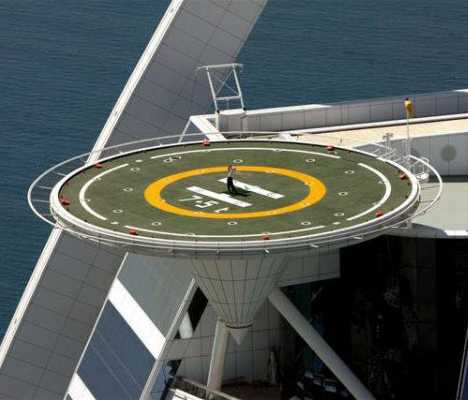 One of the Burj Al Arab’s more distinctive features are its circular helipads, made famous in 2004 when Tiger Woods was paid a $1 million fee to drive golf balls of the helipad. No telling if he got a hole in one… or more of the cars parked far, far below. 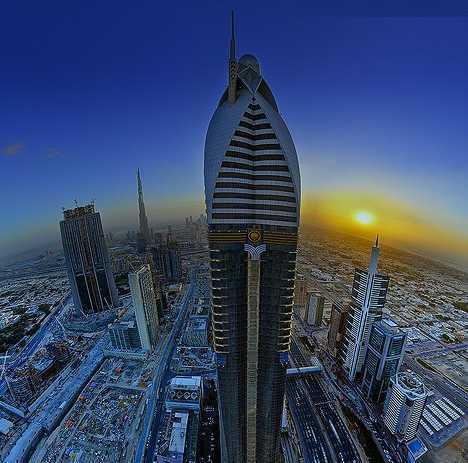 The Jumeirah Emirates Towers is, no surprise, located in Dubai and stands 309 meters (1,014 ft) in height. The hotel, which opened in the year 2000, offers guests luxurious accommodation in its 56 floors of rooms, restaurants and penthouse suites. The luxury is concentrated: only 40 suites are available. 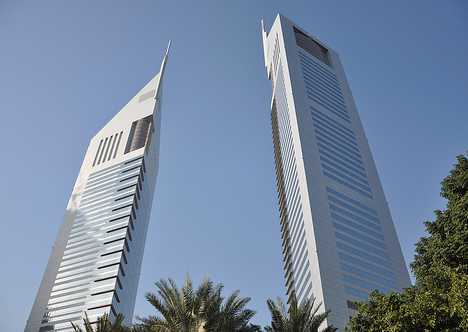 As the name indicates, two distinct buildings make up the Jumeirah Emirates Towers: one with 56 stories and the other (the Emirates Office Tower) with 54. The buildings are connected by a dedicated retail boulevard and a total of 12 elevators serve the needs of guests and staff. 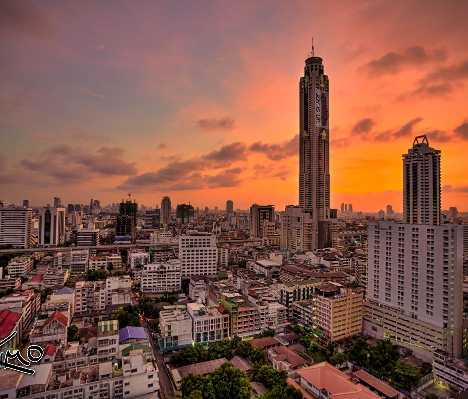 The Baiyoke Tower II in Bangkok, Thailand, is a 304 meter (997 ft) tall hotel that offers 673 guest rooms and an unparalleled view over downtown Bangkok. 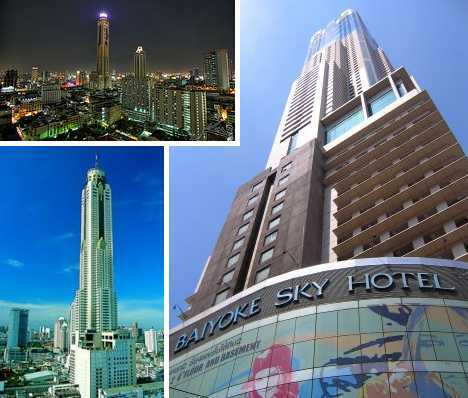 The 85-story hotel opened in 1997 and, nearly 15 years later, remains both the tallest hotel in Southeast Asia and the highest building in Thailand. 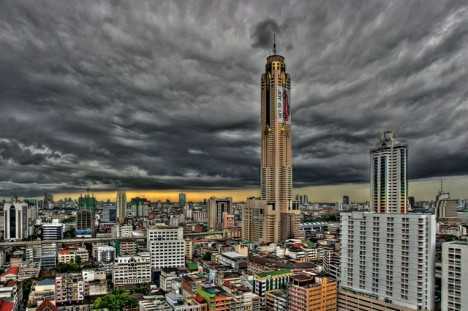 The Baiyoke Tower II’s long reign as Thailand’s tallest building is about to come to an end, however. 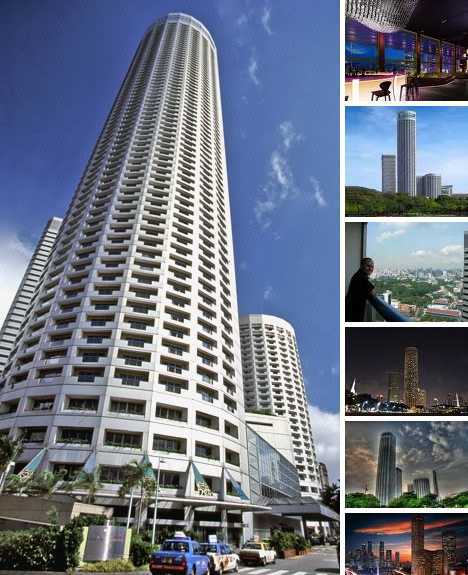 In 2012, the Ocean One Tower in Pattaya is expected to open with an announced height of 367 meters (1,204 feet). 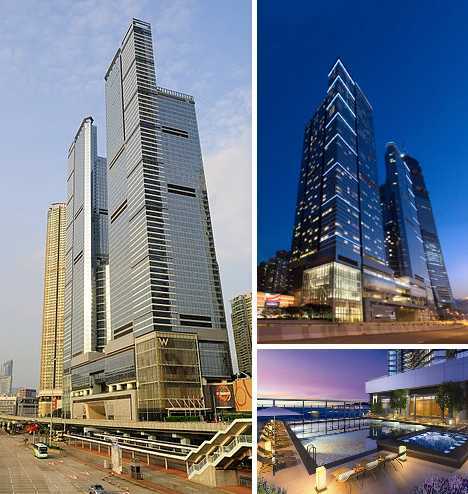 The 270 meter (886 ft) tall Cullinan I hotel soars 68 stories into the sky over Hong Kong. 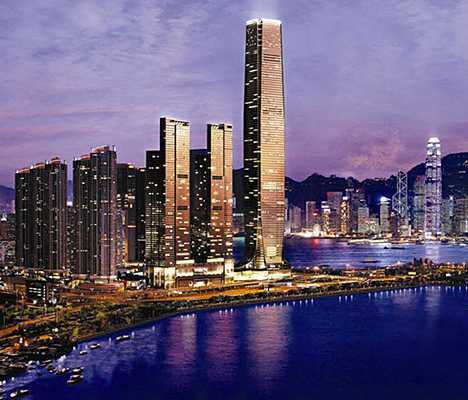 Opened in 2008, the hotel is part of a massive, twin-tower complex that dominates the skyline seen from Victoria Harbour. The hotel is just one part of what is billed as “a world landmark” and “the ultimate residence.” Indeed, an article in Time magazine speculated the Cullinan “could well qualify as the world’s most expensive apartments.” One would assume the room rates are sky-high as well. 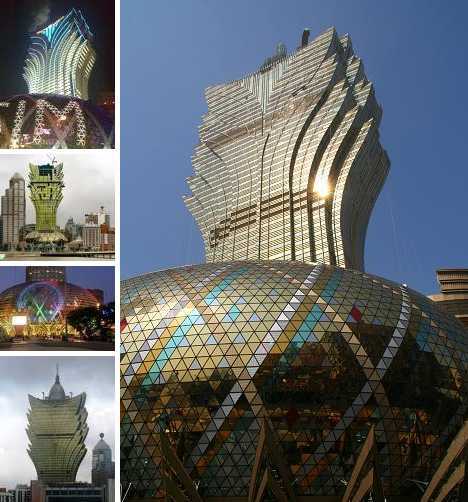 Opened in 2008, the Grand Lisboa Casino and Hotel complex in the former Portuguese enclave of Macau stands 261 meters (856 feet) tall and displays an especially flamboyant design rendered even more so when lit up at night. 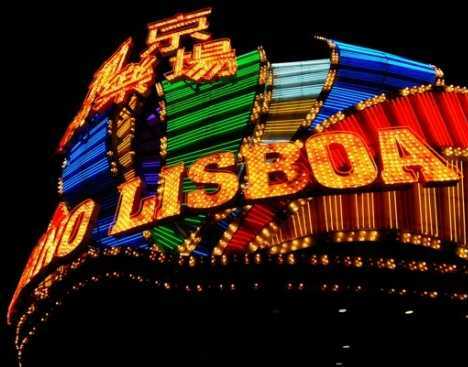 The 47-story Grand Lisboa contains 430 hotel rooms and suites, and is a gambler’s paradise offering 268 mass gaming tables and 786 slot machines. It also contains the 3-star Robuchon a Galera restaurant whose wine list offers an astounding 7,400-plus labels. What a way to celebrate your winnings… or drown your losses. 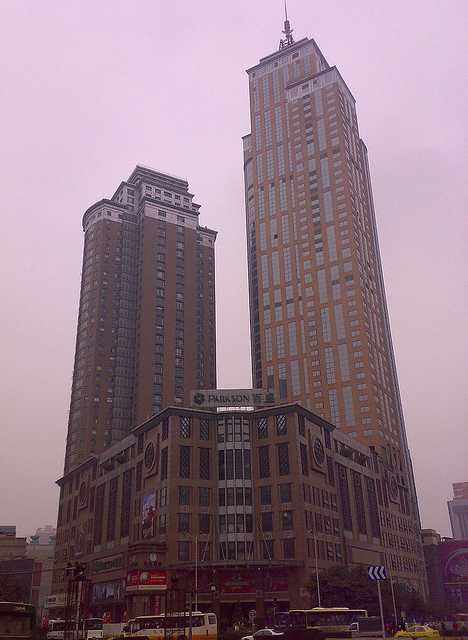 The Lanko-Grand Hyatt Hotel opened in 2004 and currently ranks as the second-highest building in western China. 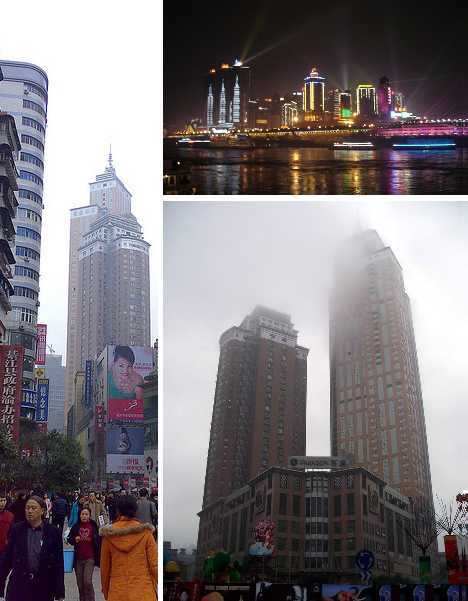 The 60-floor, 258-meter (846 ft) tall building is located in the city of Chongqing, China. Chongqing is one of China’s so-called “five national central cities” and over 30 million people live in the city and surrounding metropolitan area. The Lanko-Grand Hyatt Hotel is a mixed-use building displaying a rather conservative, post-modern architectural design and muted colors on its outer facade. The Oasis Skyway Garden Hotel in Shanghai, China, stands 226 meters (742 feet) tall. 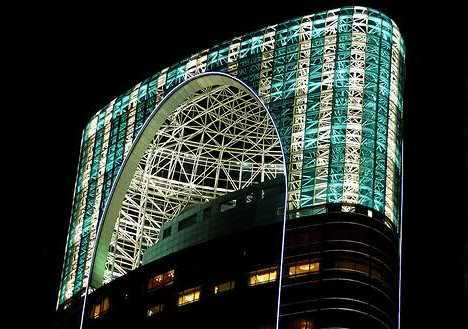 Completed in 2007, the strikingly attractive building contains 454 hotel rooms and 239 serviced apartments. The 52-story Oasis Skyway Garden Hotel both adds to and complements the futuristic skyline of Shanghai, already a symbol of China’s surge to the top rank of the world’s economic powerhouses. The hotel itself rises above the Golden Magnolia Plaza, a 4 story, 322,800-square foot podium that encloses one of Shanghai’s largest shopping malls. Swissôtel The Stamford is one of southeast Asia’s tallest hotels, reaching 226 meters (741 feet) into the sky above Singapore. Designed by renowned architect I.M. 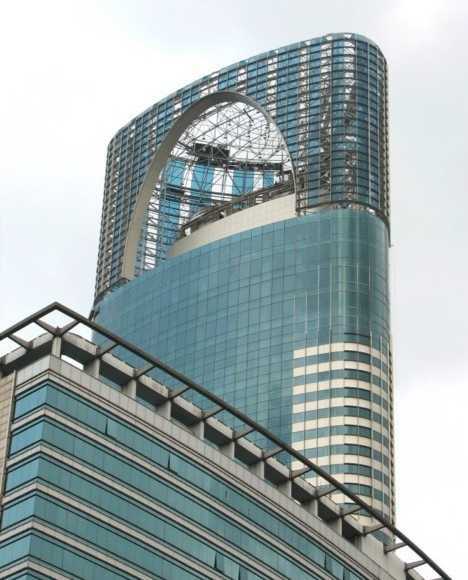 Pei, the hotel’s cylindrical spire has been a Singapore landmark since it opened back in 1986. 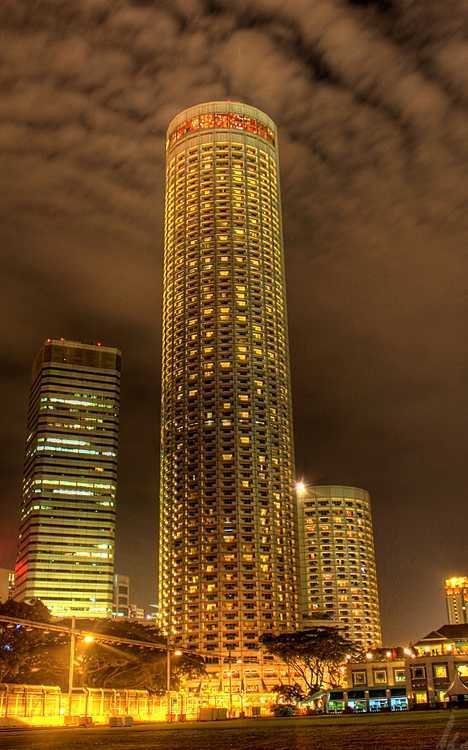 The 73-story Swissôtel The Stamford offers guests a total of 1,261 rooms and suites. The complex includes 16 restaurants and bars, the Raffles City Convention Centre and one of Asia’s largest health spas. 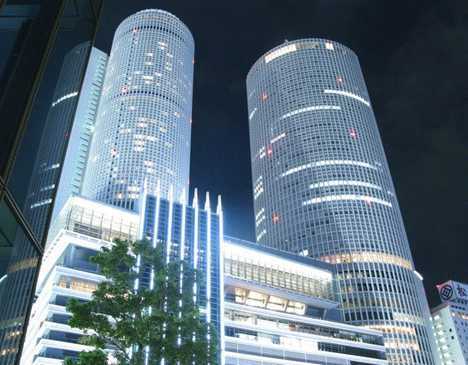 The JR Central Towers complex in the Japanese city of Nagoya consists of a 59-story Hotel Tower and a 55-story office tower. 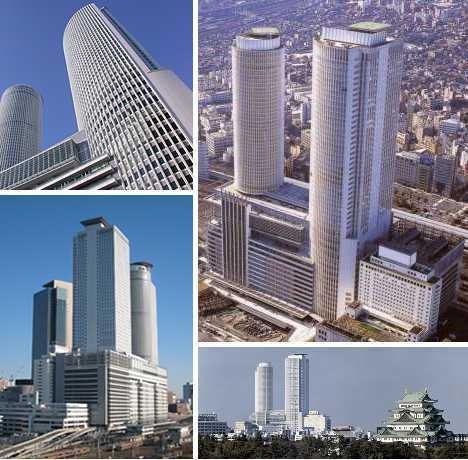 The 226 meter (741 ft) tall Hotel Tower opened in the year 2000 and is a preferred stop for travelers arriving/departing through Nagoya Station, the world’s largest rain station by floor area. As of 2005, over 1.4 million people passed through Nagoya Station each day. The Hotel Tower benefits from the constant flow of travelers who can also shop in the complex’s network of underground concourses. 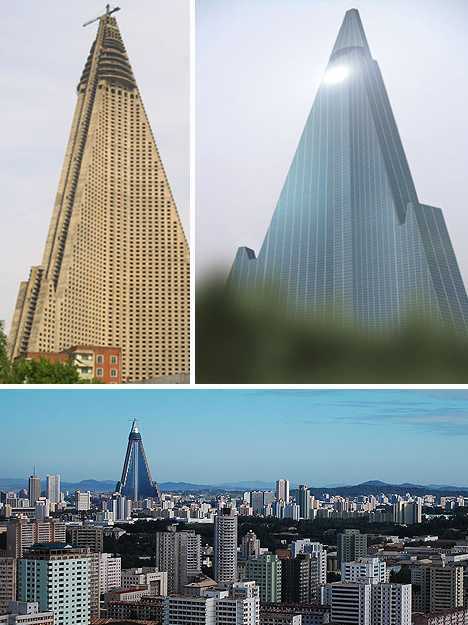 Included only for dishonorable mention is the infamous Ryugyong Hotel Tower in Pyongyang, North Korea. 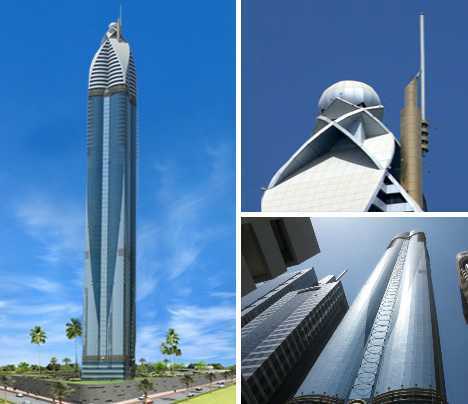 The pyramidal, 105-floor structure stands 1,083 ft (330 m) tall, just 10 feet (3 m) shorter than Dubai’s world-leading Rose Tower. 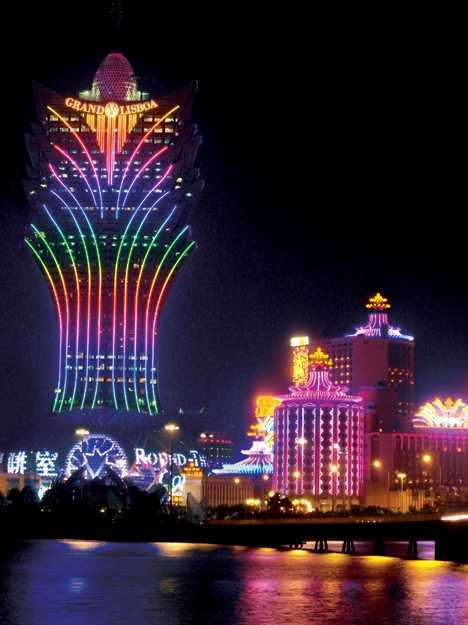 Originally expected to open in 1989 boasting 5 revolving restaurants, the hotel was mothballed in 1992 after costing the government approximately $750 million. Ground was broken for the Ryugyong Hotel Tower in 1987 and it’s been “under construction” since then – longer than every website ever to have claimed the same. Things are looking up, however… an Egyptian construction company has been contracted to jump-start work on the hotel. 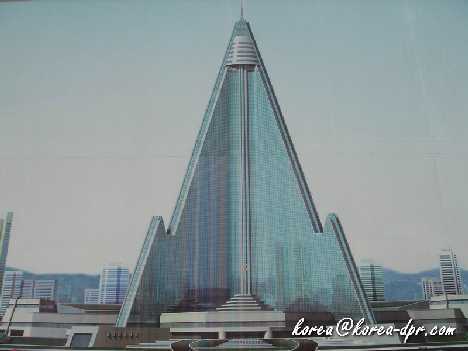 It’s estimated that completing and certifying the so-called “Hotel of Doom” (see artist’s rendering above) would cost about $2 billion – or around 10% of North Korea’s annual GDP. You could buy a small nuclear missile program for that price. Oh, wait.